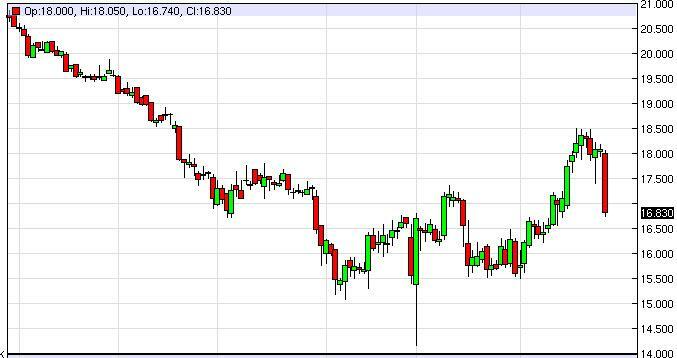 The silver markets breaking below the 17.50 level during the session on Thursday is indeed a very bad sign. After all, we had formed a hammer on what was once resistance, so it appeared that the resistance was now going to be support, something you want to see time and time again. That is basic technical analysis, and as a result we believe that this market breaking below there is in fact a very bearish symbol of the markets attitude, and as a result we feel that the silver markets are in fact going to continue to break lower. With that being the case, we feel that the market will probably drift all the way down to the 15.50 level, where it will find massive support. The question then becomes whether or not this market breaks down below there? If it does, that would be very negative. With that being said, the market formed a very negative candle in the sense that we closed towards the bottom of the candle and that of course implies that we will now follow through. Short-term rallies should be thought of as selling opportunities, as the downtrend seems to be well intact. But forcefully, a lot of people probably got flushed out of the market as it initially looked as if we were breaking out to the upside. We have to admit that we were caught a little off guard on that one as well. Ultimately, the market is in a longer-term downtrend and it seems like it’s not quite ready to give that up. Watch the US dollar, because it of course will typically moves opposite of this marketplace, and as a result a strengthening US dollar will more than likely be one of the catalysts to send this market down to the aforementioned 15.50 handle.With that, we sell and sell again, and are going to ignore buying opportunities unless of course they are of the longer-term variety, which we certainly don’t have at the moment. We believe that the US dollar continues to strengthen, and that of course will continue to weigh upon silver.